I’ve lost my door keys. That is home door key and work door key. Usually someone else is in at either place but I feel scattered without them. So I am searching. 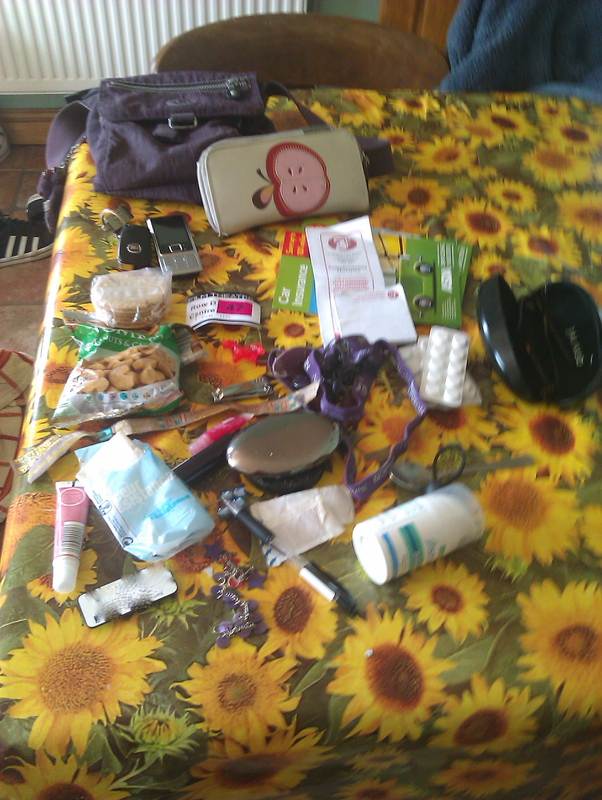 And the obvious place is my handbag ( purse to my American friends :)). I tipped it out onto the table and this is what I found. It’s like a little bit of my world in a bag. Second leaflet – alternative therapies including acupuncture. I have a painful right knee, I am arthritic I think on my right side mainly and my knee is getting worse. I’m working on the losing weight and getting fit bit. Now for the pain. Sunglasses – the weather in the UK is amazing, we have sunny sunny sunny sunshine and its warm! Lanyard form Unison ( Public Workers union)- got it from work, not sure why or what I will do with it! Cream for psoriasis/ excema – I bought this of the internet. So far it seems to be the only cream that’s actually worked. I daren’t say that too loud as things have apparently worked before then stopped. But oh, I am hoping. Sometimes I get terrible Psoriasis on my hands and feet, i makes me feel pretty bad, looks dreadful and drives me mad. This was a sample that has now run out. I’m going to commit myself and buy more and see how it goes. If it works it is priceless. Tissues – I used to cry A LOT. That seems to have passed. The tissues remain. 1 plastic pink scottie dog – from a Christmas cracker 2010, it reminded me of my favourite piece on the Monopoly board, Christmases and holidays, family, playing with my Dad as a child and his stories of playing all night in the air raid shelters in the War ( WW2). Probably the only thing missing is a book/Kindle AND my door keys! By the way I tipped out the old tissues, crumbled up oatcakes, 2 old babybels and several receipts for nothing interesting. So what’s in your bag?! Does it say anything about who you are? Is it functional, sentimental or a bit of both like mine? And that pretty much sums me up too!